Ultimate Breakfast Burritos loaded with egg, bacon and potatoes are the best freezer-friendly make ahead breakfast. Perfect for a crowd and easy to make! Pin it to your BREAKFAST OR CAMPING BOARD to SAVE it for later! 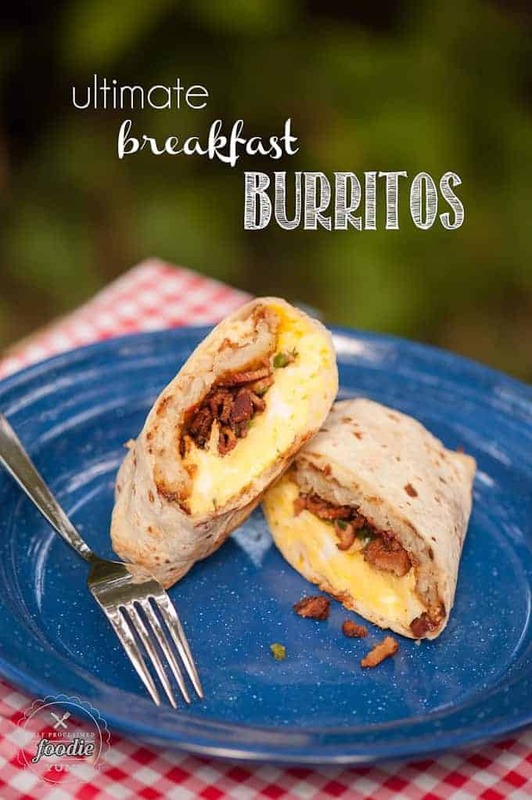 These filling and tasty Ultimate Breakfast Burritos are the perfect make ahead breakfast for any busy work week or weekend camping adventure. Our family sure does love breakfast burritos. My husband always requests that I make up a batch of breakfast burritos so that he can just reheat them when he’s hungry. Because I’m that kind of wife, I will… about 75% of the time. Even my kids love breakfast burritos. I mean, what’s not to love? You’ve got everything you love about a homemade breakfast wrapped up tightly in an edible wrapper. For most people, making a breakfast burrito is a no-brainer, but I’m just going to tell you how I do it in case it gives you some ideas that you may not have tried before. First off, the eggs must be “set but wet”. I made that term up. I’m thinking I should copyright it. Why am I telling you to make slimy cafeteria style eggs for your burritos? Because when you reheat the make ahead breakfast burritos, you’re going to inevitably cook the insides as you warm everything up. The only thing worse than undercooked eggs are overcooked eggs. Another trick is to find some really good tortillas. For this batch I tried two different brands. The ones with the dark spots won me over as far as stretchability and softness. I can’t stand it when my tortilla tears, and I really push them to the limit. 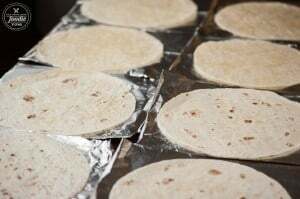 When you’re looking for a tortilla to use in your breakfast burrito, look for the biggest and softest flour tortillas you can find. Have everything ready to assemble and then make a large breakfast burrito assembly station. This is the best method, especially when you’re making breakfast burritos for a crowd. Once you have your cooked ingredients in your tortilla, simply wrap by folding the ends in and rolling up. Wrap your burrito tightly and then cover with foil. Store the make ahead breakfast burritos in an airtight container in the refrigerator or freezer. I like to use foil squares. I buy a box at Costco. Can you just use a regular box of foil and unroll each piece? Yes. But I feel like I have a process down when I use my special foil squares. You know I’m weird like that. I like to get all assembly line on my burritos, otherwise it just ends up being too much work. Next thing you’ll want to do is write everyone’s names on their burritos. That way you know you’ll get the one with the jalapeno and extra bacon (that’s mine!). Plus, if you have a sweet boy like I do and ask him to write everyone’s names, he’ll write a little heart next to the one that says “mom” to remind you that you’re loved. What do you put inside a breakfast burrito? I always use freshly grated sharp cheddar or some kind of cheddar blend because I like how it melts. The pre-grated stuff never melts exactly how I like. I’ve also found that I prefer to use the rectangle hash browns. Seasoned breakfast potatoes don’t give the burrito the crunch I like and lose hash browns are just too hard to make. There. I admit it. I can’t make lose hash browns. They are my nemesis because I either burn them or I add too much or too little oil. Not worth the hassle, in my opinion. The rest of the ingredients are not too hard to guess. You will put eggs, cooked bacon ends and pieces, diced and seeded jalapenos, and green salsa if you would like. I’ve also included sauteed veggies like onions, peppers, mushrooms and spinach. YUM! 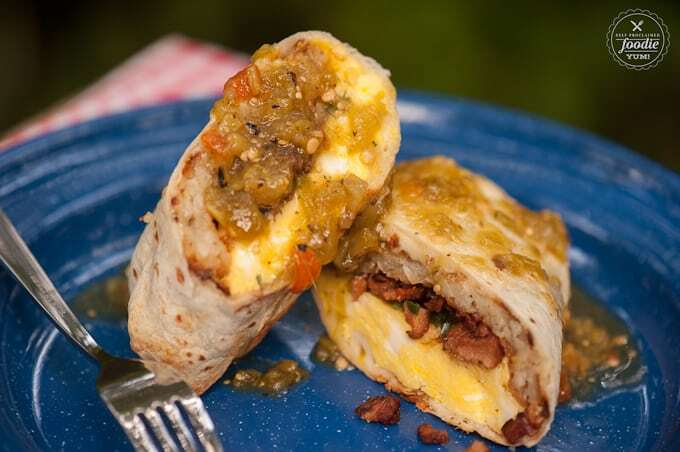 I promise you that these will be the best homemade breakfast burritos that you’ve ever had! The first step for this ultimate breakfast burrito recipe is to prepare your bacon. Pre cook your hash browns as well. That way they are nice and crispy. 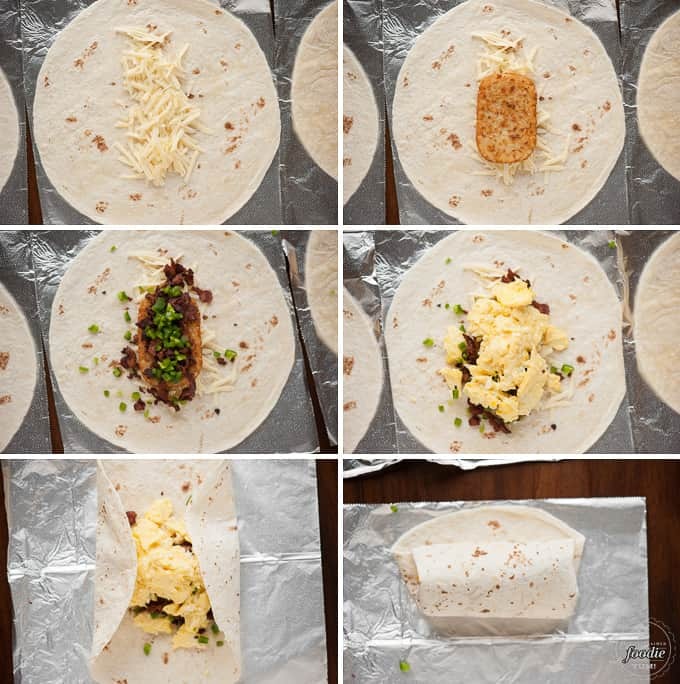 The next step is the assembly your breakfast burritos by placing each flour tortilla on a square of foil with a cooked but cooled hash brown rectangle. Divide up equal portions of your bacon, jalapeno, cheese, and scrambled eggs onto each of the tortillas. Then you will fold your tortillas to create your breakfast burritos. 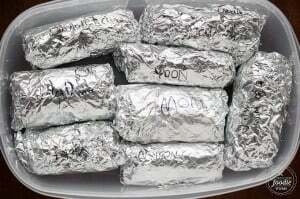 Wrap your breakfast burritos tightly with foil and store them in an airtight container in the fridge. Yes! I do it all the time. Just assemble them as I have outlined in this recipe, wrap in foil, store in an airtight container, and freeze. The day before you want to eat your breakfast burrito, take them out of the freezer and allow them to thaw in the refrigerator. How do you reheat breakfast burritos? 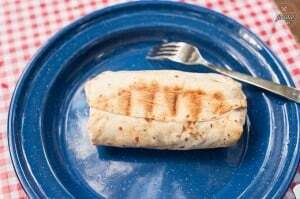 We love to take these burritos camping because we just heat them up inside their foil on the grill or over the fire grate, rotate occasionally to heat through, pour on some (also warmed by the fire) hatch green chile salsa, and BAM! You have the most satisfying no-mess camping breakfast. That tortilla gets so wonderfully crisp on the outside and everything you put on the inside is perfectly hot and steamy. SO GOOD. If you aren’t camping and want to reheat your breakfast burrito in your kitchen, a panini press or hot griddle works perfectly. There you have it – my ulimate breakfast burritos. Now, who wants to go camping with me? Love make ahead breakfast recipes? 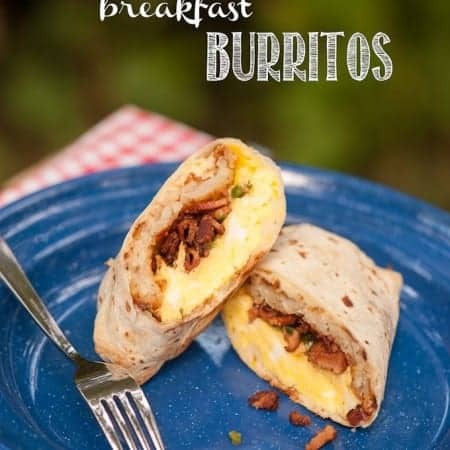 Ultimate Breakfast Burritos loaded with egg, bacon and potatoes are the best freezer-friendly make ahead breakfast.Perfect for a crowd and easy to make! Start by cooking your bacon in a heavy bottom pan on the stove top. 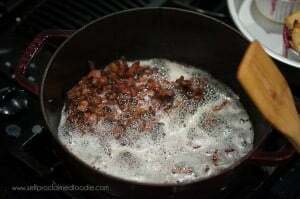 Start over high heat and gradually reduce the heat as the bacon cooks to prevent burning while stirring regularly. Set cooked and drained bacon aside. To make your eggs, whisk eggs in large bowl until well mixed. Using large saute pan, melt butter over medium low heat and cook eggs while stirring very infrequently until "set but wet". 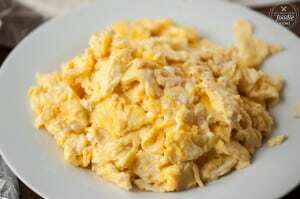 Imagine cafeteria scrambled eggs that are too underdone to eat. You want them to be slightly underdone so that they finish cooking when you reheat your breakfast burrito. Set aside. 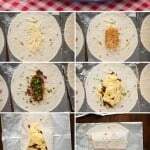 Assemble your burritos by placing each flour tortilla on a square of foil. Top each with a cooked but cooled hash brown rectangle, along with equally divided portions of bacon, jalapeno, cheese, and scrambled egg. Wrap by folding in ends and then rolling up. Wrap tightly with foil. Store in an airtight container in the refrigerator. When ready to cook, allow chilled burritos to come to room temperature. Then, place foil wrapped burrito over hot grill or campfire grate, rotating until heated through. If reheating at home, a panini press or hot griddle works great. Tortilla will get nice and crispy, cheese will melt, and eggs will be perfectly cooked. Top with salsa and enjoy! These directions are for making your breakfast burritos ahead of time. This post was originally created in July 2015 and has been updated with more fun facts and tidbits for your reading pleasure. Question….How can I make these ahead & just heat here at home??? I would LOVE to make this for my teenager for his breakfast before school!!! How long will they keep for? We’re going on a week long road trip & wondering if they will last? Will these be OK to freeze? How far in advance can you make these? Would they be okay 3 days in advance? I have also used tater tots instead of hash browns, which works really well! I am totally going to try and find these hashbrown squares though! Seems way easier! Any suggestions for baking these instead of a grill? I need to make 20 for a basketball team and an oven would be better for me due to the large number. THANKS! What size of Burrito shell do you use? Hi Shawn, I love really big breakfast burritos, so I always pick the largest tortilla I can find (at least 12″). Hello could you make these ahead lets say on a Friday for a SUnday brunch? IF you put them in a sealed container could u reheat them in the over? Absolutely! We always make these in bulk and freeze them. Just make sure you barely cook the eggs as they will cook more when you reheat. Also make sure you thaw completely before cooking. I prefer to reheat on the grill in some butter (lord have mercy) but the oven works well too! Sounds Perfect. A food truck years ago used to do this almost exact mix only added some cooked ground sausage as well and I could not wait for that truck in the mornings ;). Ditto on shredded hash browns. How long can seven stay in then freezer maximum? Hi Kelly, I make these for my husband all the time for him to take into work. If you wrap them airtight, I would think they will last at least 3 months. Ours usually only last about a month because he eats them all. So what brand tortillas were your favorite and worked the best then? It changes based on what I can find. Bigger is better when it comes to breakfast burritos! Hi Krissy, would I have any issues if I use frozen tortillas, make burritos and then freez them again? Hi Tanya, I don’t see any issue with doing that as long as the tortillas taste fresh when you thaw them the first time.